Sales of cut flowers have decreased recently in the U.S. floral market. Some experts posit that this could be correlated with changes in disposable income, causing some consumers to move to the lower-value end of the market. Others contend that this decrease in floral purchasing could also be due to barriers such as price or the availability of alternative gift items. Regardless of the reason, more than half of the retail floral industry revenue is comprised of sales of floral arrangements, so if we are to have any hope in influencing future purchases of flowers it is essential for industry participants to better understand consumer behaviors and opinions regarding purchasing flowers. Floral designers have long been taught that the most important attributes of floral design are the elements of line, color, texture, pattern, form, space, and size. Yet, little formal research has been conducted to determine which of these elements are truly important to consumers and drive their purchasing behavior. This consumer research project seeks to answer this overarching question and thereby enhance the likelihood of floral purchases in the future, increasing sales for florists and bouquet makers alike. Which visual elements of the arrangement or bouquet are noticed first and longest by consumers? What is the optimal mix of flowers in an arrangement or bouquet? Can some species be substituted without impacting consumer liking? Do consumers prefer multi-colored floral arrangements over single-colored floral arrangements and to what degree does it impact their purchasing decision? Do consumers prefer mono-species bouquets over mixed-species bouquets? Do consumers prefer a flower arrangement because of its form or because of the species of flower(s) that are in it and how much do these characteristics matter? Is there a significant difference between consumer preferences for arrangements with a symmetrical design versus an asymmetrical design? These are not easy questions to answer and just asking consumers their opinion would lead to biased results (people don’t always do what they say they will do). We know from experience that people tend to “buy with the eye” when purchasing flowers (and produce). 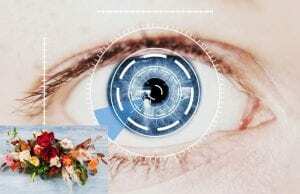 Therefore, we are using eye-tracking technology to obtain the “eye view” of consumers when viewing the elements of a floral design while shopping. 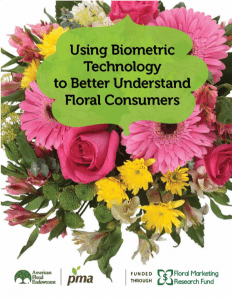 We will also utilize biometric sensors that will allow us to assess the emotional responses of individuals and investigate how they “feel” while viewing flowers and measure the correlation between these emotions and the likelihood of purchase. The study will include hundreds of regular consumers and will be conducted at the Human Behavior lab at Texas A&M University, one of the largest labs of its kind, which consists of 16 seated eye-tracking (ET) stations and an area that simulates retail purchasing venues (e.g. florist or supermarket-style stations). 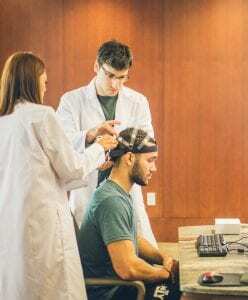 In the lab, we can accurately collect biometric data, including eye movement, facial expressions, neural signals (electroencephalography), galvanic skin response, and heart and respiration rates. The result is a greater understanding of how context and emotions influence behavior when making floral purchasing decisions. In other words, we are able to capture true “revealed” preferences of consumers rather than their “stated” preferences alone. As the adage goes, “If you always do what you’ve always done, you’ll always get what you’ve always gotten.” Obviously, declining floral industry sales is not the path we want to continue down. The researchers are hoping the results of this study, which are expected to be available in Fall 2019, will help us to more fully understand floral consumption behaviors and maybe even change the way we design and merchandise flowers in the future to increase the likelihood of their purchase. Floral Marketing Research Fund has many other studies already available! Check them out here.